Get ready for a Medieval Adventure that will take you back to a different time. 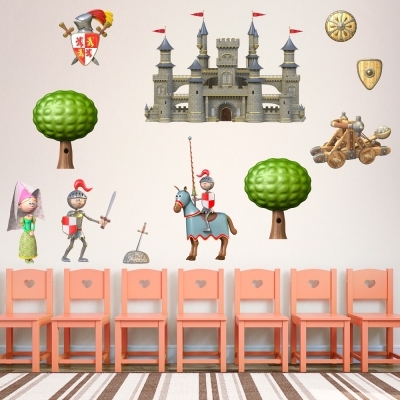 This 3D Medieval Castle Kit Wall Decal will turn any kids room into a medieval experience. Example mockup picture may not be 100% to scale. Sheet Size- 96" x 49"
Assembled Size - 150" x 104"
Horse Knight- 18.5" x 36"
Knight- 16" x 24" Princess- 11" x 24"
Coat of Arms- 23" x 24"
Sword In Stone- 7.5" x 12"
Tree (2)- 20" x 24"
Round Shield (2)- 12" x 12"
Triangle Shield (2)- 10" x 12"